Tempatnya cukup bagus, pelayanannya cukup bagus, cukup memuaskanlah menginap disini. This studio-typed apartment offers comfort place with complete facilities but also with affordable price. Located in Central Jakarta, this apartment offers easy mobility to several business centers, office building, and shopping centers such as Thamrin City, Grand Indonesia, Plaza Indonesia, Hotel Indonesia Kempinski Jakarta, and Plaza UOB. Therefore, this apartment is the best choice for workers, businessman, or travelers who are having business in Jakarta. Moreover, this apartment has easy access to Halim Perdanakusuma Airport. Public transportation is also accessible such as Karet Train Station and Transjakarta Bus shelter Tosari ICBC from apartment building. Apartment with classic interior design with the combination of white and brown colors which give cozy atmosphere in this room. Besides that, there are several wooden furniture which give classic and modern atmosphere. When you enter the room, you could see a king-sized bed and TV set for relaxing while you are watching movie. There are also wardrobe and single sofa in this bedroom. Kitchen is provided equipped with refrigerator, gas stove, microwave, cooking and dining utensils. One bathroom is available equipped with shower, water heater, and other bathroom amenities. Several outdoor facilities are available such as swimming pool, gym, ATM, restaurant, and children playground. You could also access Thamrin City Mall by only walking from apartment building. Free WIFI access and charged laundy are available in this apartment unit. 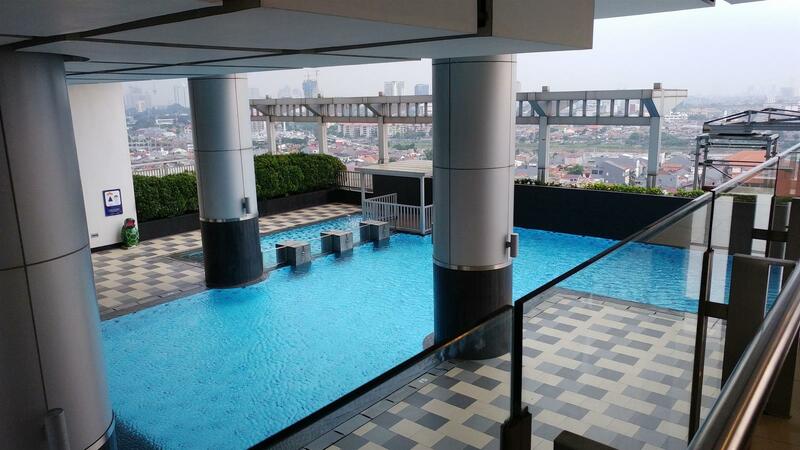 Classic Studio Cosmo Terrace Apartment at Thamrin City By Travelio is available to rent for daily, weekly, and monthly. Halim Perdanakusuma Airport could be reached in driving for 31 minutes (15.6 km); Karet Station is only 4 minutes driving (950 m); Transjakarta Bus Shelter Tosari ICBC could be reached by driving for 12 minutes driving from apartment building (3.5 km); US Embassy is only 21 minutes driving (7.0 km); Japan Embassy could be reached by driving for 13 minutes (4.2 km); Plaza UOB could be access by driving for 12 minutes (3.4 km). Thamrin City is only 5 minutes walking (400 m); Grand Indonesia could be reached by walking for 9 minutes (650 m); Plaza Indonesia could be access in 10 minutes driving (800 m); Tanah Abang Market is only for 20 minutes driving (3.5 km); National Monument could be reached by driving for 16 minutes (5.1 km); If you like to go to park, Suropati Park could be reached by driving for 14 minutes (4.2 km); Ismail Marzuki Park is only 17 minutes driving (4.9 km); and Menteng Park could be reached by driving for 15 minutes (4.8 km). The studio-typed apartment provides a king-sized bed equipped with star-hotel quality linen. There are also TV set, wardrobe, and white single sofa. Kitchen is provided equipped with refrigerator, microwave, gas stove, dining and cooking utensils. One bathroom is available with shower, water heater, and other bathroom amenities. Moreover, the apartment is also facilitated with swimming pool, gym, ATM, restaurant and children playground. Free WIFI access and charged laundry are available in this apartment. We provide linen with five-star hotel quality.